I've seen her a few times now and I think she's absolutely brilliant! Her shows were so much fun. She's absolutely adorable. She's from Austrailia and started out as a teen actor. She then moved on to music in the band Decoder Ring. She is now on Epic Records. I'm sure you're all familiar with her song The Show. It's been on Ugly Betty, A commercial for The Gap. Her other songs have been on Grey's Anatomy and 90210. Here's a link to more. Here is a link to my Lenka Playlist on YouTube. You can check out her website here, her MySpace here and there are a lot of fun things on herYouTube page. My favorite is her singing Skipalong in the car. She's been on a headline tour for a few weeks now but is soon going to be opening for Missy Higgins. Be sure to check her out if she comes to your town. You will not be disappointed!! Oh. My god! I cannot believe this is a real song! I always wonder when this commercial comes on who it is, but then forget who it is! I love "The Show!!" It's so fun! Oh ive heard of her! i have her album and adore it! i was surprised when i saw it at target today... but it's great - good call, Let! Pretty cool that she's doing the solo music thing now; her songs are so fun to listen to. Definitely planning to get her album soonish. Thanks Steph. I got mine at Best Buy. I was very surprised they had it but it seems if you get in on iTunes you get a bonus track called Force of Nature. They don't even sell it as a single on iTunes so that kinda sucked. Yeah. I am looking forward to seeing her on the 26th in Orlando. Sadly, it's just as an opener but it will still be worth it. ROAD REPORT FEB 4TH 2009. Hello and here's hoping today is a good day for everyone out there! I'm in Boston, wrapped up in a hotel robe, hiding from the snowy outdoors and relishing some relax-time. Been on the road for about 25 days, eaten about 17 pounds of crappy truck stop food and done about 14 live shows. Here's a highlight - the other night in Toronto we decided to do a live disco remix of The Show. It's something we muck around with at soundcheck sometimes, and i was feeling inspired by the recent remixes of Trouble and Don't Let Me Fall (you'll hear them soon), and the fact that it was my first sold out show! Check out this fan's video of it...so funny. Um, can't think of anything else to write right now... i'm tired. Lotsa love! See you soon. 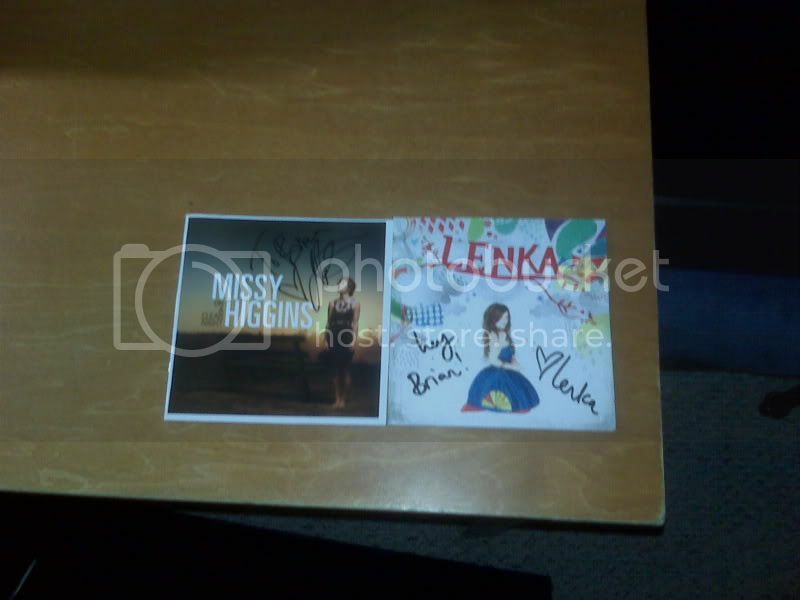 I saw Lenka open for Missy Higgins last weekend, she was good! Very charming and entertaining. She signed CD's after her set so I went and got one. I was pleasantly surprised by her set. So far my favorite songs on the CD are The Show, We Will Not Grow Old, and Skipalong. I am seeing her again on Monday!!! I hate that she's only an opener but I was surprised that she did like, 7 songs. (I went to the show in Orlando before the cruise, didn't stay for Missy and only 2 Justin songs) She is super sweet. She gave me a hug and asked how my holiday was going. We'll see if she still remembers me on Monday. Thank you SO much for posting this, B eclv! I love you right now. I looked at this thread a few days ago, then downloaded her CD. Listened. Then immediately went on Amazon and bought it because she's WONDERFUL! My favorite is her singing Skipalong in the car. limb and suggest Lenka will be heralded (at least in Australia) as the best new solo artist of 2009. Howzaaat! Better late than never, Aaron. That's fantastic news. I hadn't heard that. I still love, love, love her! I saw her 2 more times in April. She did a few new songs, my favorite being Pull Me Apart. She posted a blog with a link to it on her MySpace which I thought was really cool. AND she did the The Show Disco Re-Mix which was awesome!! Looking forward to seeing her at Outside Lands in SF and Bumbershoot in SEA.